Welcome to a new way to do stuffing on Thanksgiving. 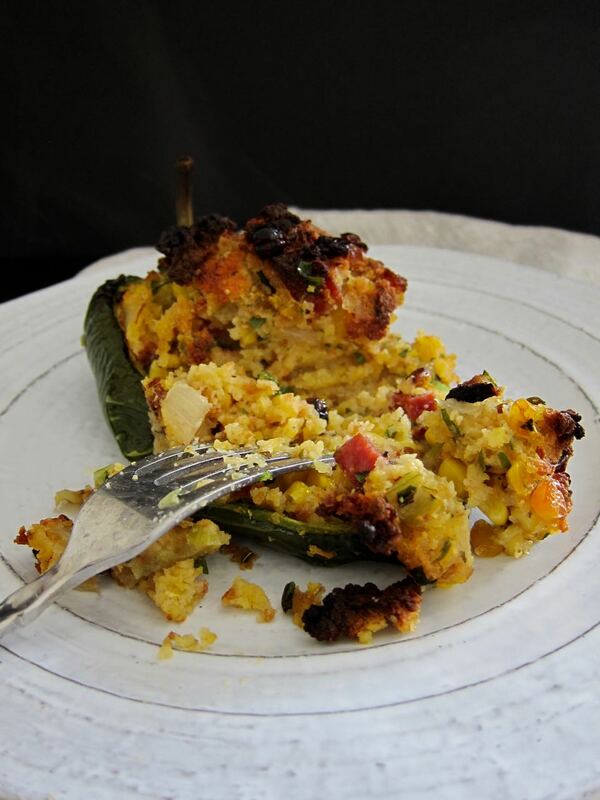 These stuffed poblanos are a recipe I dreamed up last Thanksgiving in Tucson, when I wanted to try a little Southwestern riff on the standard stuffing dish. The result, when I laid these on the table, was a bit of initial skepticism that turned into full on enthusiasm as I watched people I have otherwise never seen consume veggies go back for seconds and thirds. It's a winner, for sure. It's savory, spicy, salty, and full of lovely corn flavor, all packed into a soft, perfectly cooked poblano pepper. There's no stuffing wet bread into a turkey cavity and stressing about whether you let it cook enough, and no accidentally over-loading your plate with stuffing because these babies are perfectly portioned. You add a filled half of a pepper to your plate and have plenty of room for the potatoes, veggies, and bird. And for me, one of the best parts of this dish, aside from the flavor bomb it brings to your plate, is the color it brings as well. The poblanos add spice, sure, but they also add more green to break up the beige monotony that can be a Thanksgiving table laden with carbs and starchy sides. And bonus, I can tell you from experience that if you take one of these and mash it in the middle of your Thanksgiving leftovers sandwich on Friday, you will not be sorry. Serves a crowd, can easily be halved. Heat oven to 400 degrees. Whisk together cornmeal, flour, baking powder, and salt in a large bowl. In a separate bowl, whisk together egg, milk, syrup, and butter. Stir wet ingredients into dry. Pour into a buttered 8-inch baking dish, and bake 25-30 minutes, unitl golden. Cool 10 minutes in pan, then turn out onto a wire rack and cool completely. Heat oven to 350 degrees. Melt the butter in a large skillet over medium heat. 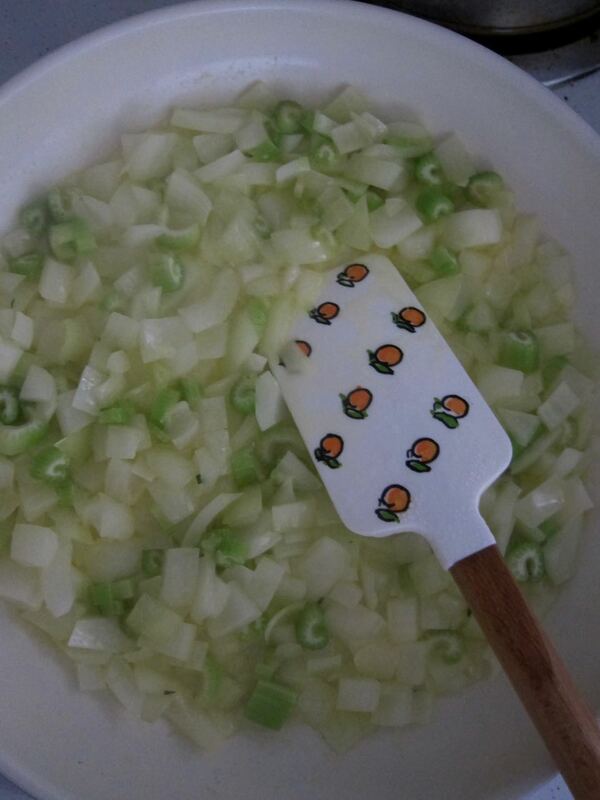 When butter is foaming, add the onion and celery and cook for about 8 minutes, until softened. Add chorizo, corn, herbs, and salt and pepper and cook for 5 minutes more. Crumble cornbread into a large bowl. Add the cooked vegetables and chorizo mixture to the crumbled cornbread and add the parsley and broth. Toss all together until well-combined. Stuff the peppers with the cornbread mixture. It will all fit! Arrange peppers on a buttered baking sheet and bake, uncovered, for 1 hour. Serve hot.